The Inglot lipsticks priced: - Rs.850/- each for 4.5g/0.16 US OZ. of all new Inglot products. All Inglot cosmetics are produced within the European Union and 95% of them are manufactured in our own state of the art production facilities. We work with make-up artists and colour consultants to bring the latest trends in colour, texture and form to the market. We are constantly developing new products and have just launched the world’s first ever Breathable Nail Enamel ensuring better health care for nails whilst enhancing their beauty. Our unique Freedom System allows customers to experiment with countless shades and colour combinations of different face products, giving them the opportunity to create their own customized colour palette. We are present in 280 retail locations worldwide. FORMULA NOT TESTED ON ANIMALS. Inglot lipsticks come in a solid metal case with glossy finish case that add classy look to the packaging. The bottom of the lipsticks shows the numbers of the lipstick shades. I wonder why they don’t have any proper name. I mean it’s hard to remember the shade numbers and I hate it as it creates lots of confusion. I wish Inglot hear this and give some names to their lipsticks. wear while the shade 419 is a bright pink that are just perfect for night outs. The shade 410 is a bit more drying than the pink one. So whenever I applied the shade 410 [brown] one I feel a little tug and pull in my lips while applying it whereas the pink one is glides smoothly on lips. heavy meal it fades a little leaving an even stain on lips that are also pretty wearable. The lipstick being dry in texture so proper exfoliation should be done and application lip balm or lip gloss is suggested if you feel too drying. 2. The lipsticks are super matte. 4. Stays for more than 6 hours. 5. Can survive small meals and drinking tea and coffee. 6. Leaves a lovely lip stain after heavy meals that are pretty wearable. 7. The shades never bleed. 8. 1-2 swipes of lipsticks give full coverage. 2. Being matte it tends to dry your lips. Leaving these two cons I don’t find anything else. My ratings:- 4/5 for the cons I deducted 1. If you are a true matte lover like me then you can grab these shades or some other shades from this range else people with dry lips either avoid these lipsticks or use lip balm or lip gloss above or beneath the lipsticks. Being pricey it is not always possible for everyone to buy or afford these lipsticks so here are the dupes of these two shades that pretty affordable and easy available too J I won’t say that the below mentioned shades are exact dupes but these are near about duoes of these two shades. I found the following are dupes of these two shades but you can find other dupes too .The dupes of shade 410[brown] are Kate moss 19 [that I already reviewed here] , Colorbar dress to impress lipstick, Colorbar Amber lipstick . For shades 419 the dupes are Kate moss 20 [I reviewed it here too] , sleek loved up lipstick,inglot amc lip pencil in shade 28 [reviewed here too]. 419 is gorgeous! My lips are dry anyways though so I tend to avoid mattes. I liked both the shade .. the pink is so pretttyyy and brown is so tender.. and loved that u put in dupe list too!! both the shades are awesome! wowww, I loved both the shades! Gorgeous lip swatches. Loved the shades! Great review Sam, it's a very nice shade! Like it! i love both :P thnk u for ur lovely comment ! I must say you really have a pretty collection of lipsticks!!! They are almost everywhere!! Beautiful swatches,I like 410 a lot. i love both of my babies..i mean lippees :) thnk u for commenting ! I liked both the shades!thanx for dupe alert info! 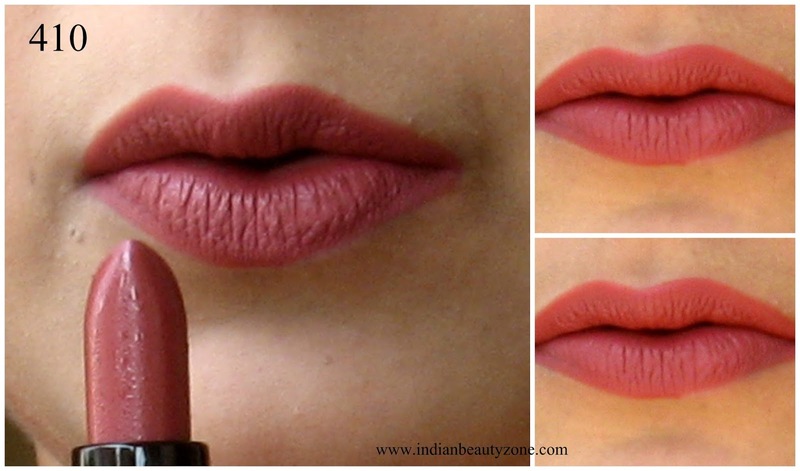 Lovely shade and suits very well on your cute little lips Samannita..
Amazing collection of lipsticks, congrats honey!!! Wow! Beautiful shades, love them!